Lately I’ve been using Read It Later as a sort of temporary-bookmarking system. Between my RSS feeds and my Twitter stream, I come across much more text than I can stop to read in the middle of the day, and Read It Later provides a pretty elegant combination of tools of saving these pages for later – a Firefox extension for marking pages and an iPhone app for reading them. An especially great feature of the RIL iPhone app is the way it handles offline reading. When I sync my list, it stores a copy of the source web page, which I can then either read in its original HTML form or after RIL applies its remarkably reliable text-extracting algorithm. In this way I get a lot of reading done while on the subway and away from internet access. When I got a Kindle recently, I thought that it would be ideal to shift some of this long-form reading from the iPhone to the Kindle’s larger and easier-on-the-eyes screen. A bit of searching turned up Kindlefeeder, a website that will collate RSS feeds and send them as a single document either directly to your Kindle (incurring a $0.15 charge from Amazon) or to your email address, whence you can then transfer to the Kindle via USB. 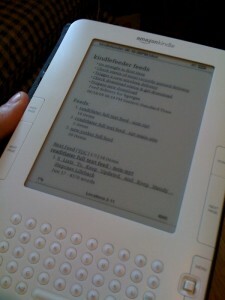 RIL provides feeds for a user’s reading list (here’s mine http://readitlaterlist.com/users/kachooney/feed/unread – you may have to edit your RIL privacy controls to make sure that your items feed is not password-protected). I plugged this feed into Kindlefeeder, but immediately ran up against a wall: RIL’s feed contained titles only. Since my goal was to make my reading list available offline, I needed full feeds. This seemed like a job for Yahoo Pipes. (Bonus for me: I had never given YP more than a cursory glance in the past, so this was a good chance for me to learn the ropes, er, pipes.) The strategy: hand my RIL titles-only feed to YP, and tell YP to fetch the full text of each item and store it in item>description of a new RSS feed. Then, subscribe to the YP RSS feed with Kindlefeeder. Here’s a sample: http://pipes.yahoo.com/pipes/pipe.edit?_id=3a0be51021240c9eda3541ce5041a29f. 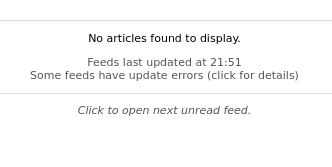 You’ll notice that I’ve filtered out feed items pointing back to http://nytimes.com. That’s because the NYT (1) breaks up most articles into multiple pages, and (2) publishes pages that are uniform to submit to a single parse. NYT feeds are thus handled by a different pipe, one with a few extra steps. First, instead of calling up the item>link from the RIL feed, I get the printer-friendly version (so that it contains the entire article text on a single page). Second, I filter out the header and footer material (advertisements, navigation, etc.) with “cut content” under “Fetch Page”. If, in the future, I find myself sending a lot of items to RIL from another source with similarly uniform markup, I might create yet another filter to strip the extraneous content off. So go make some computer technologies of your own. Get out of the house and go do it! Date: June 22, 2009 · Author: Boone Gorges.